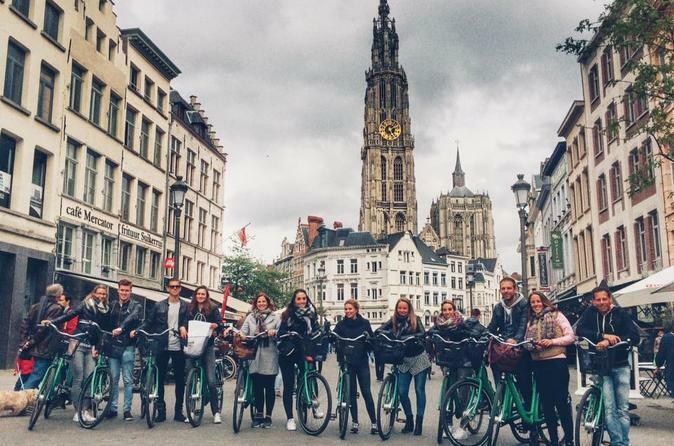 Cycle through the city on this guided bike tour in Antwerp. Interesting and fun for all ages, including children seats, baskets, helmets, bikes, e-bikes, classical bikes, and more. You have five different tours to choose from: Classic, Classic by Night, Kids Tour, De Koninck Tour (beer tasting and brewery visit), Burie Chocolate Tour, as well as the Bike & Boat Tour. Be amazed at this bustling area while on your sensory-driven or family-friendly adventure. Classic Tour: During this 3-hour tour we cycle through old and new parts of the city, experience the uniqueness of different neighborhoods, from medieval buildings to Art Nouveau. Enjoy the rooftop view on The MAS or stroll along the dockyards. The most complete and therefore ideal tour to start discovering the beautiful city of Antwerp. Kids Tour: A family fun tour. Discover the highlights, admire the view from upon the MAS-rooftop and cycle at 101 ft (31 m) below surface during this light and easy 2.5 hour tour, included time to play. Classic by Night Tour: In this short version of our Classic Tour you will sense the vibrant evening atmosphere of Antwerp. During this 2-hour ride we cycle along beautifully illuminated squares and historical buildings. The perfect start for an unforgettable night out in the city. The Koninck Tour: The perfect tour for epicureans. Discover the city highlights combined with a visit to the Beer Experience Center of City Brewery De Koninck. Cycling tour, visit and beer tasting included. Burie Chocolate Tour: Our ‘chocolate-lovers’ tour. Discover the city highlights and enjoy the fabulous chocolate creations of chocolatier Burie. In this tour you’ll find out the story of chocolates and taste some delicacies accompanied by a coffee, tea or a homemade chocolate milk. Chocolate gift to take home is included. Bike & Boat Tour: Combine the best of our Classic Tour with a 'Beer & Chocolate Cruise'. After an hour of biking in the old town you'll get on board of the nostalgic Flandria 24.